With so many organizers on the market, deciding which ones to splurge or skimp on, or those to skip entirely, can be more challenging than actually organizing. 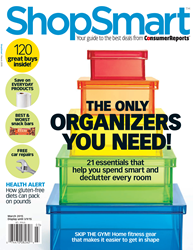 The March 2015 issue of ShopSmart, from Consumer Reports, highlights 21 essentials to help declutter every room – and identifies organizing items worth spending on, when to save, and six money-wasting products to avoid. Food storage containers. Bring order to a fridge by scrapping mismatched deli containers. Opt for see-through class containers that can be used to safely store, reheat, and serve food in them. Hangers. Ditch wire and mismatched hangers for sturdy matching ones. Use space-saving nonslip flocked hangers, which keep garments put. For most garments, choose an all-purpose hanger made of sturdy plastic that can help clothes retain their form. For heavier coats and jackets, use sturdy wooden ones. Charging station. Instead of charging gadgets throughout the house, do it in one spot with a charging dock. Pick one that fits with the décor because it will be on display. Exposed bins, baskets, & boxes. When storage for magazines, remotes, video games, and other living–room essentials needs to fit in with the décor, spring for the nice stuff. Visual order may inspire dwellers to put things away. Plastic boxes. Sturdy see-through boxes bring everything to order – mani-pedi supplies, crafting materials, and more. Pick a style that is stackable with a hinge top so the lid doesn’t pop off, especially if the box is overstuffed. Shoe rack. Good shoe-organizing systems aren’t always pretty, but the best ones make it easy to grab a pair and go, and can handle increased volume. Avoid wire racks and those that hang on the inside of a closet door. Wall-mount organizer. These corral mops, brooms, and other cleaning supplies without hogging precious closet space. Many cost $25 or less. Storage bins. Inexpensive fabric bins keep closets from becoming a dumping ground and there’s no reason to spend a bunch on ones that will be behind closed doors. Bulletin boards. These can encourage paper hoarding. For those who don’t have a desk with a drawer, opt for a hanging file box that looks neat on a desk and does a better job of keeping track of important papers. Tomato keeper. These can cost $6 or $7 dollars and can take up space. Use Ziploc bags instead. Bra organizer. These contraptions require extreme folding skills and take up more space than gained. To keep bras neat fold soft-cup bras in half and tuck them in a drawer; stack padded bras. The full list of organizing essentials is featured in the March 2015 issue of ShopSmart on newsstands now. Consumer Reports is the world’s largest independent product-testing organization. Using its more than 50 labs, auto test center, and survey research center, the nonprofit rates thousands of products and services annually. Founded in 1936, Consumer Reports has over 8 million subscribers to its magazine, website, and other publications. Its advocacy division, Consumers Union, works for health reform, food and product safety, financial reform, and other consumer issues in Washington, D.C., the states, and in the marketplace. Launched in Fall 2006 by Consumer Reports, ShopSmart draws upon the publication’s celebrated tradition of accepting no advertisements and providing unbiased product reviews. ShopSmart features product reviews, shopping tips on how to get the most out of products and “best of the best” lists. It’s ideal for busy shoppers who place a premium on time. ShopSmart has a newsstand price of $4.99 and is available nationwide at major retailers including Barnes & Noble, Walmart, Kroger, Safeway and Publix. ShopSmart is available by subscription at http://www.ShopSmartmag.org. ShopSmart is available 10 times a year. Subscribe at http://www.ShopSmart.org.